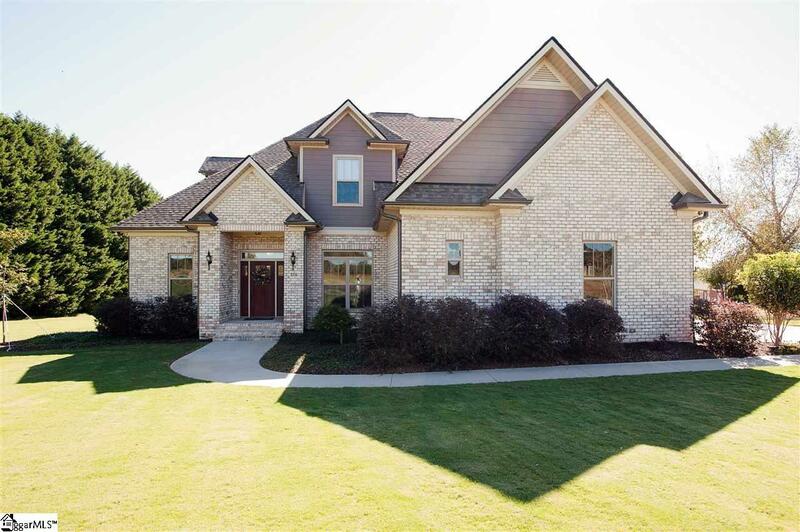 1.23 acres and Amazing Brick home in Willow Creek golf community. Well maintained 4 Bedroom / 3.5. bath. The main floor features a large Master bedroom and master bath that you will love. Enjoy cooking your meals in this kitchen with double island and lots of counter top space. Enjoy the Fp while prepping your meals and cooking from the adjoining great room. The main floor also includes a oversized laundry room, Dining Room and flex room for office or living room. 3 car garage that has a no threshold entry and all doorways on the main level are built to be handicap accessible . Staircase leads up to 3 bedrooms and to a sizeable Bonus room. At the rear outside of the home is a covered porch to enjoy your morning coffee or tea and overlooks a large level lot with privacy because the neighbors are so far away. Storage will never be a problem because you have lots of floored walk out attic storage. Partial yard irrigation system incapsulated crawl space and a Lennox pure air purification system. Subdivision amenities include clubhouse, and community pool. If you are a golfer that is a additional fee for membership. Travel to I-85 , shopping , Five Forks, BMW, GSP Airport, and major cities like Greenville are just minutes away.. Listing provided courtesy of Laura Simmons of Laura Simmons & Associates Re.